Membuat Report dalam CRM vtiger tidak serumit lainnya, cukup akses menu Reports. Reports provides your sales team the ability to extract only data relevant to them from thousands of records. You may use these report features to get an overview of customer related activities and to draw conclusions on how to improve your sales process. You can generate reports based on desired criteria by using filters. You can group records of a kind in Folders. By default, all reports will be stored in All Reports folder. You can also create a custom folder to store your reports. The second step in creating reports enables you to select columns to be displayed in your report, group by a particular field in ascending or descending order, and perform calculations on integer and currency fields. You can select fields from selected module to be displayed in your report. You'll need to click on text space provided to select fields. Additionally, you can also select fields from related modules you've selected in Step 1. While generating reports, more often, the information is not uniformly distributed. The information under same field is scattered and it makes the report cumbersome to handle. This feature enables you to group information basing on selected field. You can group them either in ascending or descending order of alphabets. For instance, consider multiple contacts that are related to same organization. While creating a report on Contacts module, the results can be scattered. Select check-boxes to perform calculations on Currency and Numeric fields. Records filtering conditions has been made very simple. Conditions are grouped into two blocks. 6. Provide condition to filter selected records. You can skip this step if you'd like to create report on all existing records in selected module. All Conditions : Filters records based on AND condition. Displays the results if and only if ALL conditions will be matched. If one condition is failed, other  queries will not be executed. Any Conditions : Filters records based on OR condition. Displays the results if at-least ONE condition is matched. If one query is failed, other queries will  be executed. By default, AND condition is enabled between ALL conditions and ANY conditions. This will help you in grouping the two conditions. 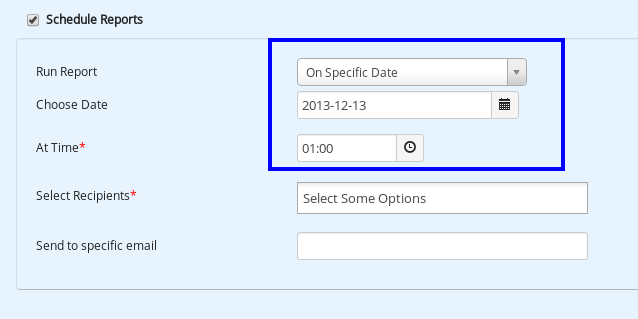 You can also filter the records on custom and existing date fields. You can provide existing or custom criteria to filter records. The conditions are dynamic. For instance, Today as filter condition will display all the records on current day. It will not display the same records tomorrow. It will display the records of present day instead. You can also proceed without creating any filter. That will display all the records of selected module. If you want to modify the same report all over again, you can click on Customize Report button in the detail view of the report. This feature gives you the flexibility to export your reports to .csv or .xlsx files. You'll need to click on corresponding icon in the detail view of the record to export it. Additionally, you can also print your reports by clicking on print icon in the detail view of the report. With this feature enabled you can now send Reports in csv format at regular intervals to specific users through email without logging in to the CRM. During Report creation, Step 1 captures the required configuration for Scheduled Reports. Frequency can be configured based on the regular intervals required for the Report to be dispatched. Daily Report will be emailed every day around the specified time. Weekly Report will be emailed every week, on the specified days around the specified time. On Specific Date Report will be emailed on the specified date around the specified time. Monthly By Date Report will be emailed every month, on the specified days around the specified time. Yearly Report will be emailed every year, on the specified months & dates around the specified time. Recipients of the Email can be selected from the list of existing Users, Roles, Groups and it can be also send to any specific email address. Notes! For Scheduled Emails functionality to operate, workflow cron job should be active under the Scheduler. Vtiger supports SUM, MIN, MAX, AVG operations on all Integer and decimal fields for the Pivot reports. In addition, COUNT of records is also available on any grouping. How can I create a Pivot Report? Step 1 - Specify Name of the report, and Choose primary module (and related modules if required). Step 2 - Specify Conditions. Step 3 - Select atleast 1 Row field , and atleast 1 Column field, and the statistic to be displayed. How can I drill down on a Pivot Report? You can drill down by selecting multiple row fields or multiple column fields. For example: Select Country and City as the column fields, Industry as the Row Field for a report on Leads (select any data field). When you run the report, it will show the data in expanded format for all cities. If you want to get aggregated data at Country level, you can click on the button to the left of Country. What are the additional features in a Pivot Reports? 1. 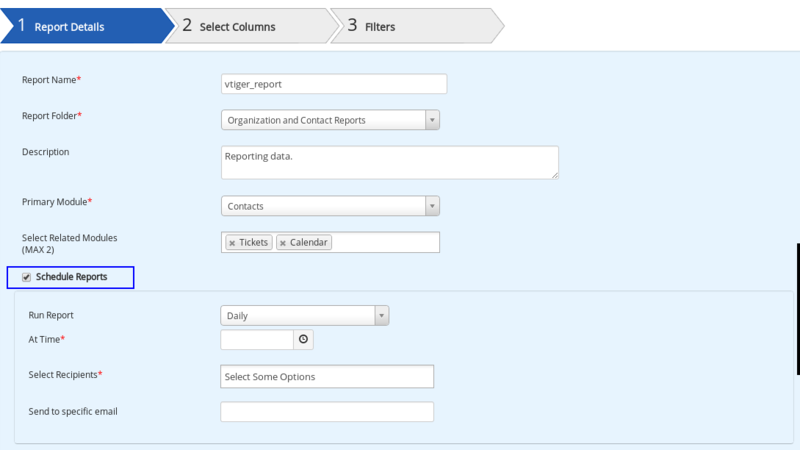 Drag and Drop row / column fields to make quick adjustments to your report without having to edit it again. 2. Add and Remove Row/Column/Data fields without editing the report. 3. Change conditions without editing the report. How can I create a custom Chart? Step 1 - Give a name to the chart, and select the primary module (& related modules if required). Step 2 - Choose conditions to select data that needs to be plotted in a chart. Step 3 - Select Grouping field for X-Axis, and Data to be plotted on Y Axis (upto 3 data fields can be plotted on a line/bar chart). Pie chart is also available. Can I drill down from the Chart to see the records? Yes. You can click on the segment of the chart that you want to drill down on to see the records. Can I pin charts to my Home page Dashboard? Gunakan Data dalam CRM Anda..